Motherwell fans were getting used to cup semi finals - we'd been in quite a few over the last couple of decades but they all ended in defeat. Could this be the occasion when we finally went one step beyond? It's probably safe to say that this was one of the worst games in our cup run. Neither side, although us in particular, played as well as they could have done. In fact, I don't think we had a shot of any note in the first half. Celtic had nearly all of the ball but did nothing with it - for all their pressure, Ally Maxwell didn't have a save to make until near the end of the game. John Collins dallied over a great chance and the defence managed to get a block in. We survived a handball in the box by Phil O'Donnell but given the accidental nature of the contact, the referee was correct to wave play on. And it was a good job he did because when Celtic attempted to build another attack it was thwarted by a wonderful series of tackles by our midfield. When Jim Griffin took the ball away, he was clattered late by Collins. The ref knew it was a genuine attempt to play the ball so there was no need for a booking. Griff got up immediately and the game restarted - a lesson to the players of today. Our sole half chance in the first period fell to John Philliben at a corner kick. Softy could always hit a good shot and he proved this again except the guy half way up the Jock Stein terrace probably wasn't the best target to aim for. The second half was pretty even with neither side managing to get on top. Maxwell was called into action and produced a great save from Joe Miller and Chris McCart completed the job by booting the ball off the line. Then came the moments that every Motherwell fan could see haunting us for years to come. There was very little time left and it was obvious that a single goal would take either side to the final. So, when Dougie Arnott turned his marker in the box only to be hauled down we thought Psycho would get a chance to do the business again. But it wasn't given. It was a clear penalty and one that would almost certainly have sent us to the final. But it wasn't given. While the fans seethed at the injustice, the team got on with it and had a nervy Celtic side on the ropes. 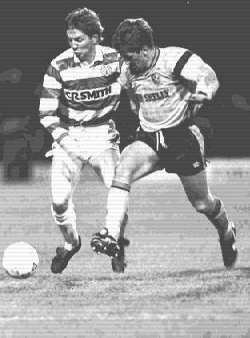 We were given a free kick a full 35 yards out from goal and in the absence of Davie Cooper, Iain Ferguson took responsibility. He let fly with a tremendous swerving and dipping shot that beat Bonnar all ends up. As the 'Well fans rose to acclaim one of the best goals seen at Hampden, the ball thumped post and rebounded to safety. The game finished soon after and not for the first time, 'Well fans were left to scratch their heads at how another semi final had failed to result in victory. At that point, I think it would be safe to assume that many 'Well fans must have thought our chance was gone. How many fans at Hampden that night experienced flash backs to previous semi's against Airdrie (lose to a goal from a free kick given for infringing the four step rule), Rangers, (robbed/mugged/cheated 3-2 having been 2-0 up), Celtic (lost after replay), Celtic (lost on penalties) and Rangers (just lost) and gave up hope of ever seeing their team at a cup final?